PictureRelate compares pictures by similarity. Of course computers can't understand what's in a picture. Pattern recognition and image analysis has tried for many decades and has failed, so far. But there are some basic image properties that can be analyzed by a computer. PictureRelate uses a set of such features to classify images. These features were designed to mimic the human eye, i.e. they use what neurologists like to call "pop-out" features. The human brain uses pop-out features to find interesting visual elements fast. So a major benefit of using this technique is: it is fast! Using a large number of such features and combining them in a weighted way often gives surprisingly good results. Therefore I decided to publish my experimental program as a technology demonstrator. Try it! With a bit of experience you can browse pictures on your hard disk and from the web by similarity by choose a picture close to what you are looking for, adjusting feature weights to fit your criterias, select a more similar picture, and repeat this process. As an additional benefit you can search for duplicate pictures, which have a different image format, or different size, or even for duplicates which have different text stamped into the image. You can create mosaic pictures made out of other pictures. For ease of use PictureRelate supports browsing, viewing, renaming, deleting, etc. 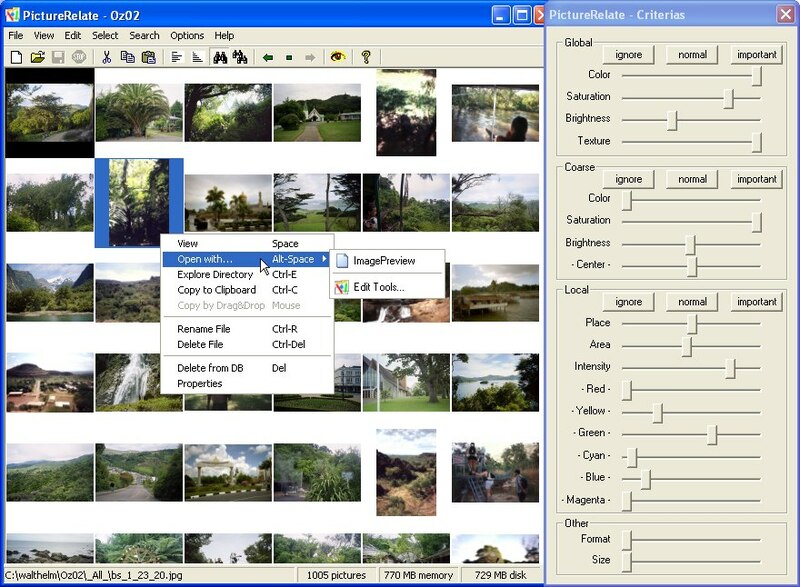 You can copy and paste and drag and drop images from PictureRelate to other applications or to the desktop and from other applications and the explorer into PictureRelate. PictureRelate reads all major picture formats like JPG, BMP, PNG and TIFF. Any other picture format can be easily imported once you did install a filter command. Examples for using IrfanView and XnViews NConvert are supplied. PictureRelate is specifically designed to work with a large number of pictures. 100.000 and more pictures are still searchable easily and quickly on a modern PC, once the database is built.